ASOS bomber jacket, Free People scoop tank, American Apparel skirt, Alexander Wang ‘Marion’ bag, Rebecca Minkoff ‘Edie’ loafers. Am I being optimistic, or have the last year’s trendiest trends proved themselves worthy of surprising permanence? The bomber jacket craze is still going strong (just ask my closet), and fall/winter collections are serving up some awesome twists on summer’s hottest trend. This jacquard bomber from ASOS has a little more weight to it than the ones I bought throughout spring, and the periwinkle faux fur collar gives it feminine, winter-wonderland flair. There’s a limitless selection of bomber jackets available now, but fur trim makes me smile, as evidenced by my previous post. It’s a statement piece, for sure, but this jacket can be styled into extremely different vibes. Here, dolled up with a polished pleated skirt and metallic loafers, I feel like an editorial version of Lorelai Gilmore (—yes, I am counting down to this month’s Netflix revival). I could create an edgier, more laid-back look by wearing this jacket with some ripped black skinnies and sneakers. To land somewhere in between, this outfit would have worked with black Nikes instead of silver loafers, too. 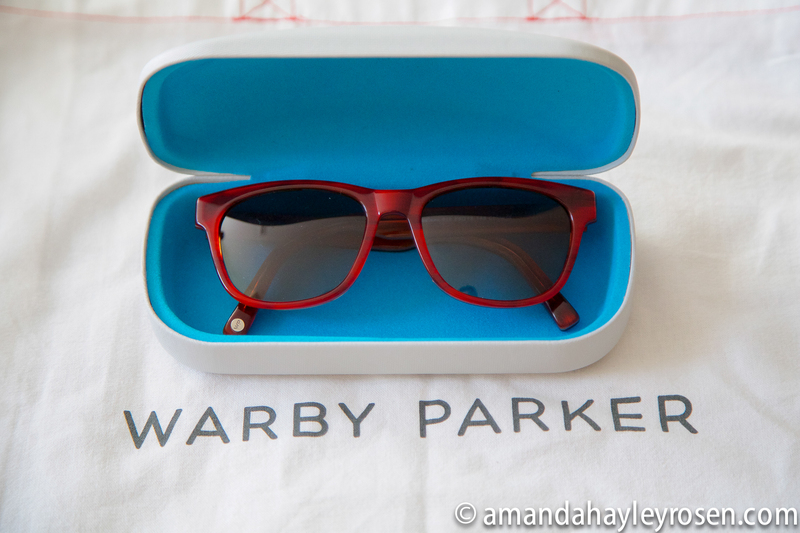 I was so excited when eyewear company Warby Parker asked me to review their new summer sunglasses collection, which debuts today! Sunglasses have always been my favorite accessory, and Warby Parker makes beautiful, fun, affordable frames for men and women—and for a great cause. For every pair of sunglasses sold, Warby Parker donates a pair to someone in need, and their sunglasses start at just $95. In short, Warby Parker offers you the chance to buy stylish sunglasses and help those less fortunate without going broke yourself. That’s what I call a fashion win-win-win. 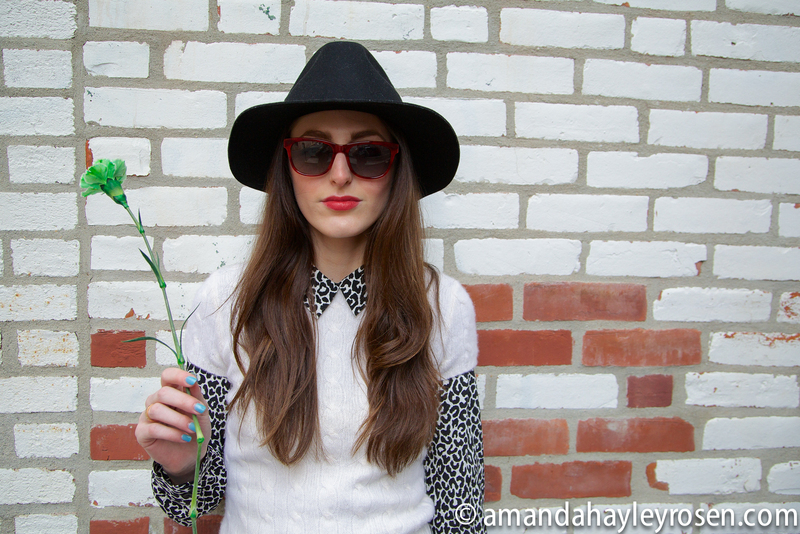 My current Warby Parkers are the ‘Madison’ in Rum Cherry, which are part of their permanent core collection. Theory printed blouse, vintage Ralph Lauren Collection shell sweater, Maje shorts, Jeffrey Campbell ‘Purvis’ platform loafers, ‘Lone Rider’ wool hat from Nasty Gal. I chose the ‘Madison’ frames because they feature a classic, flattering shape, and because this particular shade of burgundy-red is so versatile. 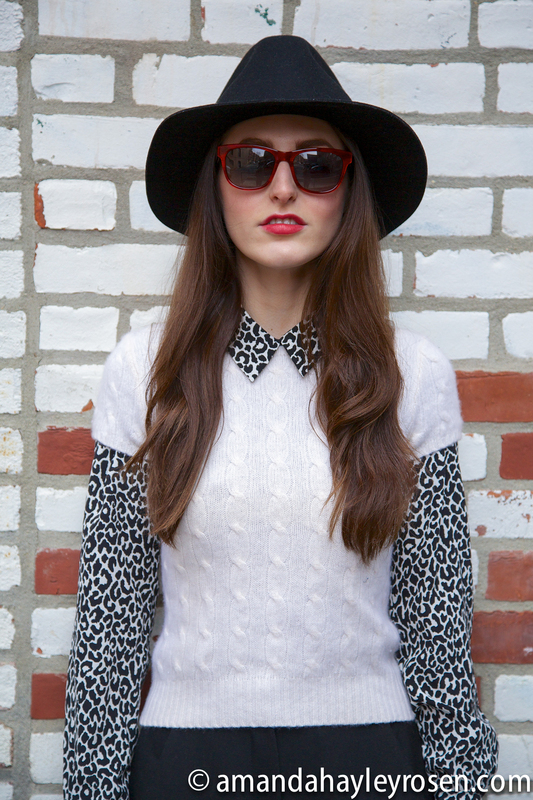 Vibrant enough to bring a little life to my first, black and white outfit, yet understated enough to wear with more colorful looks without going over the top, Warby Parker sunglasses are perfect for people with eclectic style and taste. After gushing over the whole new summer collection, I was able to narrow myself down three favorites, shown above, but I can’t seem to settle on one pair just yet. Each truly evokes the simultaneously adventurous and laid-back summer experience, and many looks from the summer line will carry over seamlessly into your fall/winter wardrobe. Stay tuned to see which pair I choose to take with me to Bonnaroo Music Festival in June, and be sure to visit the Warby Parker website to see the rest of the Spectrum Sun Collection, and to learn more about their charitable work. Warby Parker also has a store located at 83 Newbury Street here in Boston. I sincerely apologize for taking a brief sabbatical from blogging more regularly. Between a stack of 19th-century American novels, the obligation to acknowledge the Super Bowl, birthdays, Bat Mitzvahs, a loss in the family, my photographer’s ever-exciting and constant travels, nasty snow storms (–and perhaps a certain something that is now legal in Colorado), I’ve been pretty busy…or asleep. But rest assured I’ve still been playing my daily game of dress-up, and I’ll be serving up more sauce by next week. 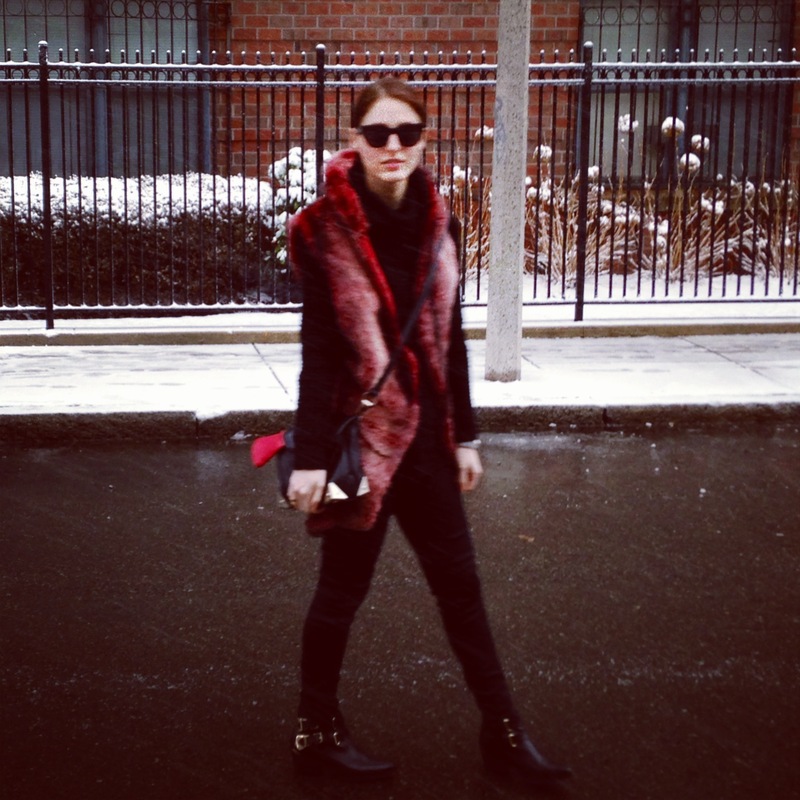 Sandro turtleneck sweater, faux fur gilet a la several LF seasons ago, J Brand coated jeans, Sandro booties, Alexander Wang bag, Oliver Peoples sunglasses. Until I inevitably cave and find a way to make that coat mine, I’ll have to enjoy smaller doses of leopard and cheetah prints, like this faux fur beret I got a few years ago via Nasty Gal, or these flats from Madewell.